Welcome to the website of the Irish Deer Management Forum, established for the purpose of implementation of short- and long-term deer management objectives set out in the policy document, Deer Management in Ireland – Framework for Action, published in 2015 by the Department of Agriculture, Food & the Marine and the Department of Arts, Heritage & the Gaeltacht. 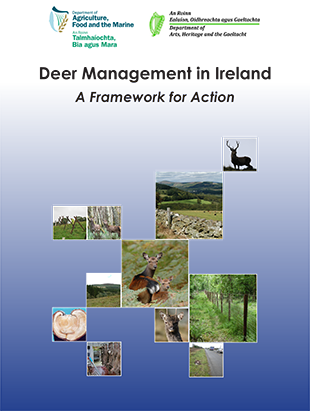 Framework for Action follows a four-year period of stakeholder consultation during which submissions were received from a wide range of stakeholder interests, including deer conservation and management bodies, forestry, farming and landowner representative bodies and wildlife bodies, including statutory bodies. The full body of submissions received can be accessed here (2011) and here (2012). The Forum is embarked on a range of objectives, including development of an effective and agreed policy, regulatory and administrative framework for deer management, and improved consultation and partnership working between landowners, land managers, Government departments, forestry, conservation and sporting interests. The Forum meets quarterly and during the intervening months its key tasks are undertaken by different Working Group, including Working Groups examining specific areas such as deer populations, density and data collection, identification of deer conflict areas and correlation of scientific evidence of cross-infection of disease including transmission of Bovine Tuberculosis (bTb) from deer to cattle, with regular reporting of findings leading to the formulation of recommendations on implementation of policy. While it is accepted that lead responsibility for deer management lies with landowners and land managers, it is also accepted that physical management requires a significant input from licenced, qualified and competent hunters, carrying out culling and management according to widely-recognised principles of best practice. RECOMMENDATIONS FROM THE FORUM - Recommendations issued by the Irish Deer Management Forum from its inception to December 2016 IDMF Recommendation 1 Deer and TB Calary County Wicklow 1. On the grounds of deer welfare, both Departments should work with landowners, land managers, hunters and wildlife interests to reduce both the density of deer (namely Sika- Cervus nippon) in the … Continue reading "RECOMMENDATIONS FROM THE FORUM"